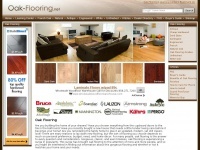 Oak flooring products, maintenance, shopping tips and buyers guide. Learning center and resources for homeowners, contractors and designers. The web server used by Oak-flooring.net is located near the city of Houston, USA and is run by CyrusOne LLC. 19 other websites are located on this web server. Most of them are provided in the english language. The websites of Oak-flooring.net are served by a Nginx server. The markup language of the website is XHTML 1.0 Transitional. The visitor analysis software Google Analytics is used to analyze the visitors of the websites. The website does not specify details about the inclusion of its content in search engines. For this reason the content will be included by search engines. In order to display ads the Google Adsense advertising network is used.